A week ago, our family met for a combined Family Home Evening with Ryan’s parents and family at the Crandall Historical Printing Museum. Our family has a special fondness for this museum, and we have been there several times. Ryan does have printing in his blood, having printers on both sides of his family. But never do I go there without learning something new. I am amazed at the ingenuity and brilliance of Guttenberg, and the tenacity it took to keep inventing, keep working until he got his printing press working. Johannes Gutenberg was a German blacksmith, goldsmith, printer, and publisher who introduced modern book printing. His invention of mechanical movable type printing started the Printing Revolution and is widely regarded as the most important event of the modern period. In 1455 Gutenberg published his 42-line Bible, known as the Gutenberg Bible. About 180 were printed, most on paper and some on vellum. And there at the Crandall Print museum, there is a WORKING replica of the Gutenberg press, and you can learn all about it. Can you even imagine living in a day when there were no books? No scriptures except for the very wealthy, and even if the regular people could read (most of them couldn’t), there would be no books to read. Because of Gutenberg, that all changed. In another room of the museum, the museum’s working replica Benjamin Franklin Press is currently printing the U.S. Constitution with metal type cast in molds made from the original punches that created the type used to produce the first print of the U.S. Constitution in 1787. You’ll visit the Philadelphia print shop of Benjamin Franklin, where he and his partners were active in printing from 1728 to 1766. This English Common Press is an exact replica of his actual press now preserved in the Smithsonian Institution. In the Benjamin Franklin Printing House Room, copies of Poor Richard’s Almanac are printed on a replica of Benjamin Franklin’s original English Common Press, and we learn how the printed word helped America win the civil war. If you thought you needed to take your family to Palmyra to visit the Grandin Printing press, you can think again. Right there in Provo, you can visit the Grandin Room and hear the story and witness the printing of a 16-page section of the first edition Book of Mormon which was originally printed in Palmyra, New York, in the fall and winter of 1829-1830. Guest will see the setting of type and feel a replica of the original Acorn Hand Press. What a miracle that Grandin and his team were able to print those first 5000 copies of the Book of Mormon in seven months. Prior to the invention of the Linotype, composing the words for just one page of a daily newspaper required almost 34 man hours. The Linotype reduced that to about 3 hours. It’s fascinating to watch and see that amazing printing machine, and to realize the magnitude of such an invention. Of course, my kids think it’s so extremely cool that Grandpa can print them a little lead stamp with their name on it–backwards. You don’t have to have special connections to tour this amazing museum. You can just drive over to 275 East Center Street in Provo. Tours are available weekdays, 9am to 2pm. Group Tours are available at any time, any day, by appointment. There is a $45 minimum charge for a group tour (includes 15 visitors). Additional visitors are $3 each. It’s a FABULOUS activity for Family Home Evening, for cub scout groups, or youth groups. If you’d like an abbreviated or self guided tour, be sure to visit the museum for Colonial Days. Jul 2 – Jul 5. Step back in time and celebrate the Fourth of July with the Founding Fathers (and Mothers) in downtown Provo at the Crandall Historical Printing Museum. Colonial Days is a FREE celebration for the whole family. From University Avenue to 400 East on Center Street, you will enter Provo’s flag-and-bunting-lined Colonial Avenue. Where you will see men and women dressed in period clothing, and others roaming the streets and celebrating at Colonial Square outside the museum. This museum is indeed a hidden treasure. One that should not be missed. The other day I decided to make bread. Actually, I read a facebook post from a friend who was raving about her fresh strawberry jam and wished she had homemade bread to go with it. Well, I didn’t have homemade strawberry jam, or even strawberries to make the jam, but I could make bread. It was early in the day and it hadn’t gotten hot yet, and I had just enough time before John’s swimming lessons to knock out a batch. My recipe makes 5 loaves, which is too much for my family to eat all at once, so I usually give a loaf or two away or freeze them. 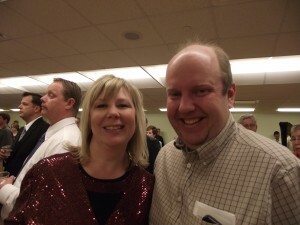 I decided to take two loaves to rehearsal that night for our director and assistant director of the community theater. They have to do a lot of yelling, and they probably aren’t getting a lot of recognition right now for all the work they are putting in. Yes, there is the reward of a great show when it all comes together, but I thought it would be nice to just give them a little something now. After my directorial debut with the old ROADSHOW, I’m much more understanding and compassionate toward those directors and the crap they go through. So, I wrote out little notes that said, “Thanks for helping us ‘rise’ to the occasion.” I gave one loaf to the director, and she seemed genuinely grateful. Maybe the loaf of bread itself wasn’t the greatest thing in the world, but hopefully she understood the message behind it. The assistant director wasn’t there, yet, but I put a loaf for her over on the table where I knew she would find it when she came in. Now a bit of backstory on the assistant director–She’s about 8 months pregnant and I have no idea why she even agreed to help with this show. She never seems overly happy, and a few nights earlier, she had been downright grouchy in directing us. As a village woman, I don’t have a whole lot of time on stage, and it seems they only want me there to watch over my fake children (and they keep assigning me MORE fake children). It’s a shame I can’t have my own daughter as my village child. Instead, I get to watch over and herd other people’s children. 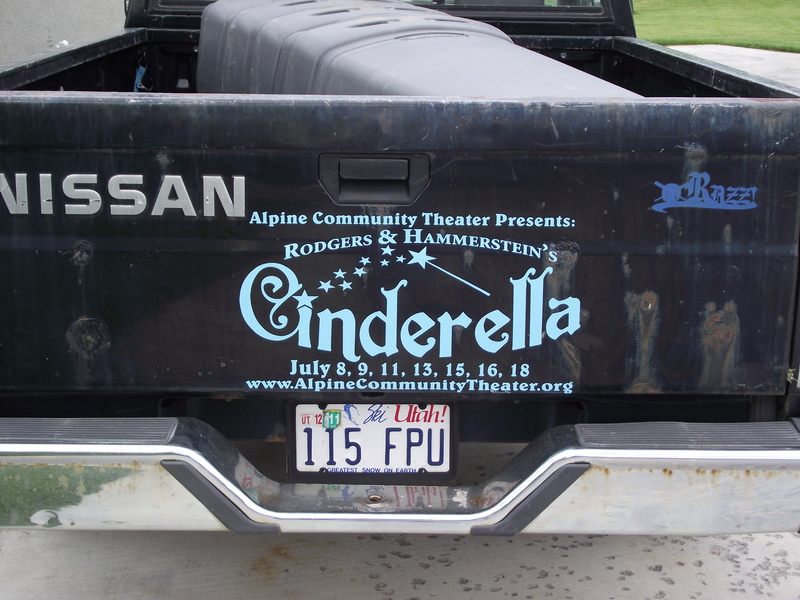 We had a rehearsal there that the director and the assistant director kept giving us conflicting directions of where to be and what to do, the “kids” that I was in charge of were out of control, and I wondered why I ever wanted to be in this show, anyway. I mean, if I wanted to be under appreciated and herd disobedient children, I could do that at home, right? Well, the next day I got an email from this assistant director. She apologized for her crankiness the night before, and explained that she hadn’t been feeling well, and –hello? She’s pregnant. No other excuse is necessary. I hadn’t thought she had been overly grouchy, but it really meant a lot to me to receive an apology anyway. We’re all just regular people, trying to work together to put on a good show, right? So–back to the night of the bread. We got into rehearsal and she came over to me, and I automatically wondered what I had done wrong this time, and she said, “Thank you so much for that bread! That is SO nice of you.” Oh. The bread. I had almost forgotten that I had left her bread. I said “you’re welcome,” and moved on. Wow! I hadn’t felt inspired, and it was really just a loaf of bread (very yummy whole wheat bread, but still, it wasn’t like I made her dinner). But to her, at that moment, that loaf of bread meant everything. In that moment I was thankful that I had listened to the little prompting that gave me the idea to take bread to these ladies. I said a little prayer thanking Heavenly Father for the prompting, and allowing me to bless their lives just a little bit. I want to be open to that kind of promptings so that I can bless lives more often. In primary on Sunday, my sharing time was about the Holy Ghost. I had several examples and visuals about the comforter, and using our senses. But my favorite analogy was that of a marble in a glass jar. If I shake the jar, I can hear that marble rattling in the jar. It makes a soft tinkling sound, just like the Holy Ghost speaks to us softly. But if the jar gets dirty, just like if our lives get dirty, (and I poured some dirt into the jar) you can’t hear the sound of the marble anymore, maybe only a faint occasional clicking sounds. Likewise, we can’t hear the Holy Ghost if our lives are dirty with sin. Now I don’t know if the kids will remember for more than 9 seconds ANYTHING that we discussed in sharing time, but I will remember. And I am hoping that I will be more open and willing to act on those promptings from the Holy Ghost. Have THREE precious weeks of summer vacation already passed us by? ACK!!! Where is the time going? This week we didn’t do quite as much as the past weeks. 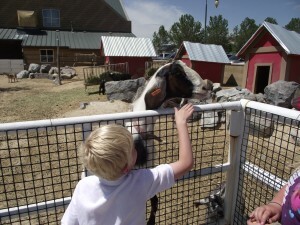 We actually tried all week to get ourselves to Seven Peaks Water park, but things like piano lessons and swimming lessons and other things kept getting in the way. We finally made it there by Friday. It worked out nicely because our friends the Hilmos were there, so Jenna had a friend, and more importantly, I had a friend. Cole brought a friend with him, and Natalie met a friend there. Megan and John did not have friends, but things worked out. Each of the kids and I took turns watching out for John, while everyone else was pretty much happy on their own. Tess and I had a place in the shade to call home base, and I’m VERY glad it was in the shade. Even with liberal use of sunscreen, we all got burned. Even I got burned, and I was really only out in the sun about half the time the kids were. Cole burned his shins and feet VERY BAD. In fact, it’s been two days, and he’s still red as a lobster. Ouch. As we were watching the slides, I thought, “that boomerang ride looks like fun. I think I’ll get Megan to go on it with me. As we climbed the three story tower, I began to wonder what I was thinking. The heavier person goes in the FRONT of the tube, so there I was, facing death. There was screaming. Plenty of screaming. This is not actually us on this ride, but you get the idea, right? Just with more screaming. Later, my friend said, “You sure were screaming. Everybody had to look up and see who was doing all the screaming.” Right. Other people scream, too. It’s not just me. It was actually kind of fun. So much fun that I decided to ride it again later in the day with Natalie. Funny how it was much scarier the second time! When Natalie and I rode it, we flipped around a lot and the whole thing made me MUCH more queasy the second time. I was done. No more slides for me. And nothing that goes around in a circle, thank you very much. It wasn’t until the next day that I felt the full effect of my careless abandon of all that is rational. Oh, my neck! I honestly think I wrenched something on that slide. We won’t be going back there anytime soon. At least not this week. And since we are talking about water, let me just mention that John is having tons of fun with his swimming lessons. We did one week of our two week lessons, and even though he wasn’t thrilled about having to have swimming lessons, he’s enjoyed it (that’s why taking lessons with a friend is such a great idea). Ryan’s family did a tour of the Crandall Historic Printing Museum on Monday night. It’s a wonderful place, and if you’ve never been on a tour there, you REALLY need to do so. Where else can you learn about Guttenberg, Ben Franklin and Joseph Smith and how the printing press changed their history? We also went and saw the movie Rio. Cute movie! 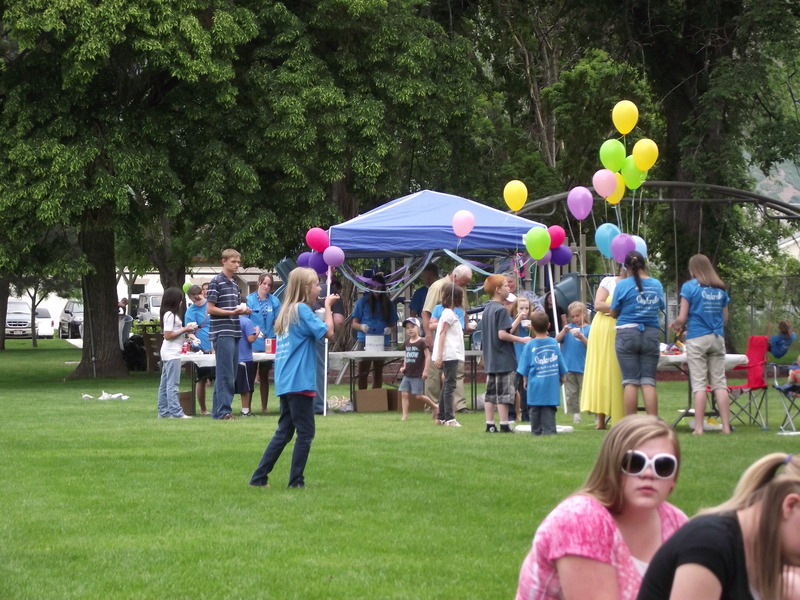 Ryan took the kids to a picnic in Provo. Natalie and I had rehearsal, so we couldn’t go, but I was glad he was willing to take them. John also had his post baseball party with his team. The coach’s family sure knows how to throw a party! Saturday night Ryan and I invited another couple to go and see Singing in the Rain at the Scera theater. It was fun show, and very well done. And I knew two people in the cast! Small world. Still enjoying the summer. Hope you are doing the same! If you are anything like me, you’ve probably been wondering a few things. Questions like: ‘Is Jimmer going to stay and play in Utah, or go somewhere else?’ or ‘What will Katy Perry be wearing in her next music video?’ or ‘What the heck is up with these gas prices, and when are they going to come down?’ Oh, you’ve got questions, allright. But I’m here to answer the more importantly, the burning question…what’s up with Paige’s chickens? After the little gal was attacked by a dog and had her near death experience, We realized we had to beef up security around those chicks. Since that’s not really something I can do (without about three trips to the hardware store and 4 hours of frustration that would probably end in injury or swearing), I was ultra thankful that Ryan took over and reinforced the coop. When I was talking about the dog dangers in the neighborhood, a friend offered up a dog run. Seems they had an extra one in their backyard after having a relative live with them for a year. Cole and Megan went over and dismantled the run, loaded it into the truck and brought it over here (have I mentioned how much I enjoy having a child that can DRIVE and run errands for me Holla!! ), and even set it up for me. At first we set the run up around the coop, but that was problematic. The footprint of the run is about a foot wider than the base of the chicken coop. 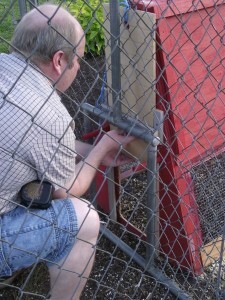 Although that added to the security, it made it hard to open the coop and feed them. We decided it would be better to have the dog/chicken run next to the coop, so that the little ladies could have a safe outdoor space to wander, scratch the ground, and look for bugs and weeds to eat. Ryan took over the remodel project, and figured out how to make a little sliding door for them. How awesome is that? And all this from the man who supposedly didn’t even want chickens! I figure these chickens are now about 8-9 weeks old, and they are growing bigger every day! I like to let them out when I am changing their water and getting them food. They especially like to wander through the garden boxes–Don’t eat THOSE plants, chickens, eat the weeds. 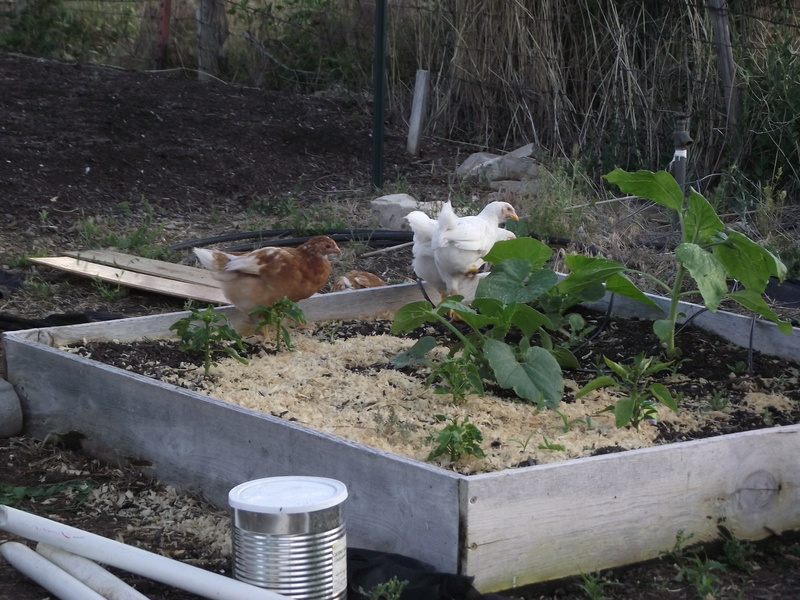 I am hoping that they will eat squash bugs and slugs, too. 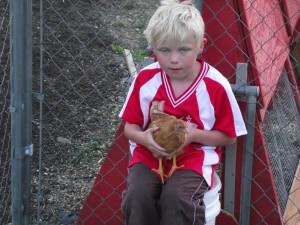 The kids all love the chickens. Almost as much as I love them! It’s actually quite irrational how much I love those chickens. I mean, they are just chickens, but I really do love them! We try to hold and pet them just about every day so they will not get all mean on us. Nobody wants a mean chicken around, especially when they get bigger. 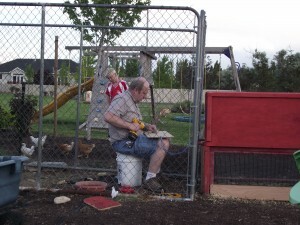 This is not the best picture of John, but you get the idea that the kids are having fun with our new little pets. Don’t think I’m talking about THAT circle of life. 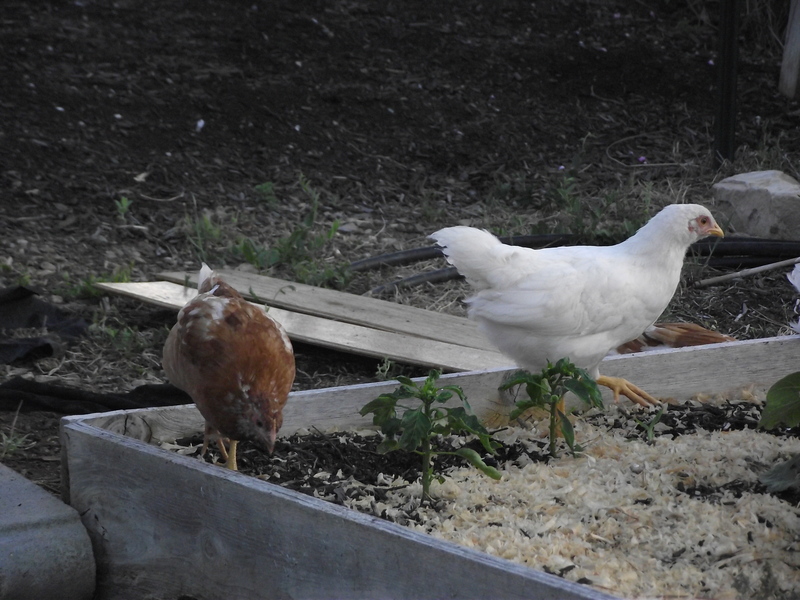 These little poultry are not going to be put into a casserole anytime soon (or ever), but I am looking forward to getting some eggs from them in the early fall. Oh, and they aren’t going to be FRIES, either. Is it the end of the week already? It was sad to say goodbye to our retiring director, Tom Waldron. There’s a great article about the bells and Tom in the church news HERE. Lagoon!–Saturday was Ryan’s company party at Lagoon, and we had a fun time there. 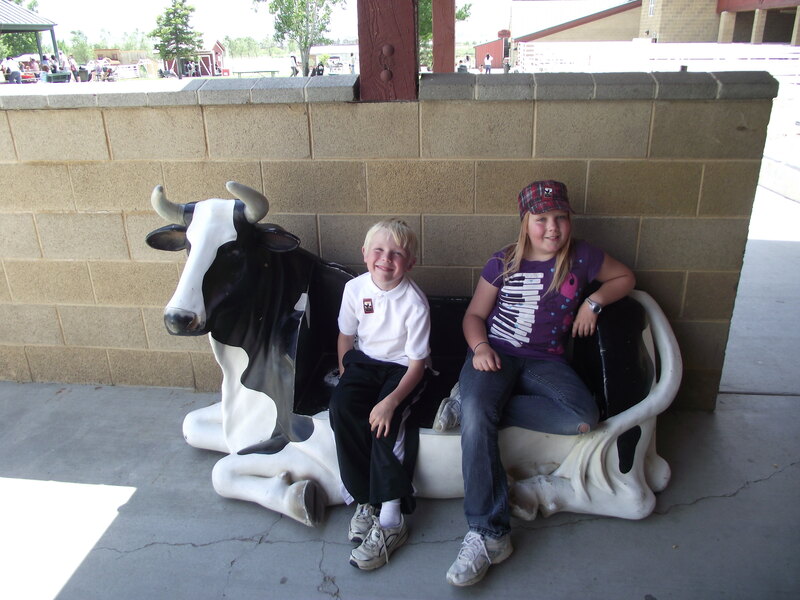 I, of course, do not ride vomit inducing rides such as the ones that are plentiful at Lagoon. Instead, I took John around to the kiddie rides, and enjoyed visiting with my good friend Kimberly, who also avoids those icky rides. Ryan and the other kids had a fantastic time being turned upside down, thrown around in circles, and generally being bumped and jostled. And it’s SO much easier now that everyone has cell phones. I could just text them, ask them where they were and when they were coming to meet, and I didn’t feel abandoned when they went off for hours riding the sick rides and I was stuck waiting for them. The best part was that it was FREE. 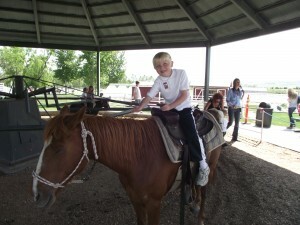 Barbeque with friends– Cole had requested that we could have a get together with his old friends David and Sam. When they were little, we used to get them together a lot. Mostly because MY friends, Melinda and Michelle and Tina, wanted to get together. Those kids played so happily together! Well, time moves on and kids grow up. Schedules get packed, and it’s harder to get families together. But the stars aligned to get Melinda’s family and Michelle’s family together for a barbeque. It was lots of fun to get those boys together. David just graduated and is going to BYU in the fall, Cole and Sam will be seniors. Sam and Jesse stayed over that night and it was fun to have them here the next day. Tennis lessons–Natalie finished up her tennis lessons, and she really enjoyed it. I don’t know if she mastered the sport, but she had a good time and learned some new skills and got some exercise. Piano lessons–The kids are continuing piano over the summer, and since John is now reading like a champ, we decided it was time for him to start piano lessons. He was SO excited about starting his lessons, he got up early (well, let’s face it, he always gets up early) on the day of the lesson. After his lesson, he came home and PRACTICED his simple tunes. He is practicing EVERY day! I’m so thrilled that he’s thrilled.. Another 10 years of this and he’ll be a musician playing John Schmidt songs like his brother. Swim–I have a certain child who is constantly asking if we can go swimming. Seriously. The first day temperatures crept above 65 degrees, she was bouncing home from school, asking if we could go swimming. I’ll admit it, I’m not a HUGE fan of the public pool, but since I don’t have a pool in my backyard, and I’m sadly not best friends with someone who does have a pool in their backyard, so the public pool it is. We had a fun time there on Wednesday, and then Natalie went with a friend on Saturday. Visit the farm–I’m going to try to visit some aspect of Thanksgiving Point once a week, since we have the pass and all. This week we picked a not too hot day to visit the farm. I only took the two youngest, since the other three were busy with youth activities. It was fun to see the grown up chickens and all the cute fluffy animals. Jenna and John enjoyed riding the ponies, and we had a carriage ride. Youth Conference–Megan and Cole had Youth Conference Thursday, Friday and Saturday. 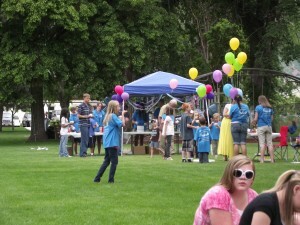 They had a great time going down to Ephraim and attending the Manti pageant, among other fun things. I was just happy to have one half of the amazing duo of fighting, arguing sisters GONE for a couple of days. It’s kind of fun to only have three kids at home, and for that middle child to be the oldest. While they were gone, we went out to dinner (two kids cheaper!) at Mimi’s cafe and I took them out garage saleing on Saturday morning. All the ice cream you want to eat for only $1 per person, free entertainment, and the opportunity to buy tickets to the show for $2 less. It was a perfect night for it, too! Overcast, but not cold, and while the rain clouds threatened, there was no rain. Father’s Day!–And today is Father’s day! Happy Father’s day, everyone! We made Ryan a scrumptious breakfast of scrambled eggs and waffles, and gave him the oh-so-extravagant gifts of new socks and a nice watch. We will have my parents and my sister’s family over for dinner tonight, so that will be fun. That’s the week in review. Gosh, it’s no wonder I’m tired. I’ll have to have the kids read here when they inevitably complain or whine that we haven’t done anything fun all summer. I just bought 10 pounds of cheese. Is that excessive? Keep in mind that I have 5 children who love cheese, 2 of them teenagers. And it was ON SALE for $3.99 for the two pound block. But I still have to find a spot for it all in the fridge. Daughter: How long do I have to weed? Daughter (flabergastedly): 30 minutes? That’s like….half an hour! Me (thinking) I’m so glad your education hasn’t been wasted on you. Other daughter, as we were driving to our favorite mexican place with the FREE all you can eat chips and salsa before the meal. Remember that one time when we ate at Los Hermanos and we totally filled up on Chips and salsa and couldn’t finish our dinner? This is what summer should be about. Oh, how I love summer. I love the lazy feel of the days, the free time, and the fun activities! Our first week has been good. Natalie has had tennis lessons every day this week, and next week. She has been having a fun time, and it’s good for her to get some exercise. One day this week while she had her lesson, I hit the track. I managed to walk/jog for two miles before I thought I was going to die. John sprinted about halfway around the track. Boy is he fast! Jenna jogged with me, and honestly, even she is faster than me. “Yeah, that is red because we did some jogging. And I will never be able to beat any of my kids. They are all faster than me. Because I’m old and fat.” I said. She went on to tell me that someday I will be able to beat John. When he’s old and can’t run fast, she will get me a really fast Jazzy or electric scooter. Only she kept saying she’d get me a really fast electric chair. So which is it, you want me to be able to go fast, or you want me to GO fast? Yeah, that makes me feel a lot better. This week we’ve had a lot of two things: Baseball and rehearsals. Since my concert is Friday night, that means extra bell rehearsals, so I’ve been gone a couple nights. Natalie and I also have tiny parts in this year’s Alpine Community Theater production of Cinderella. So that adds a couple more rehearsals this week. John had his last regular baseball game, then started his tournament. 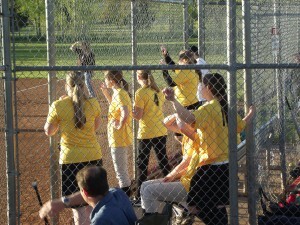 Wednesday they pulled off two wins in a row, despite micro bursts and plummeting temperatures. That means two more games, whether they win or lose. And he’s not the only one. 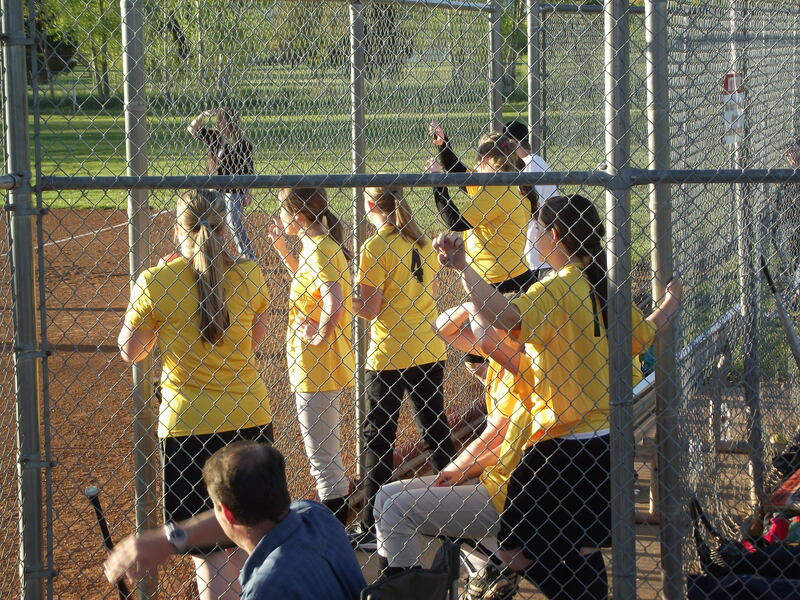 Megan and Jenna are also playing softball, so they’ve each had at least one game a week. Wednesday I took the kids to Trafalga in Lehi. We had fun miniature golfing together. 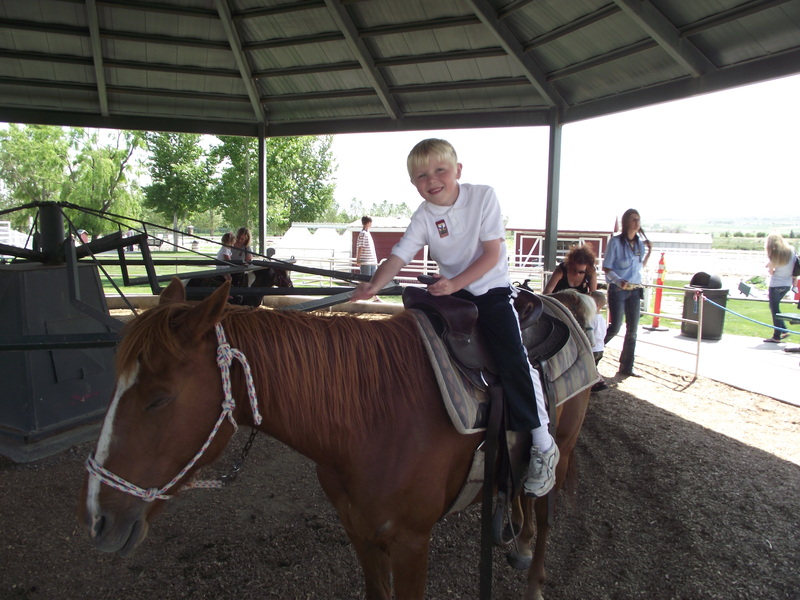 They also rode the merry-go-round, the go carts, and had a great time. It was a nice way to spend the afternoon. Since we have some extra time on our hands, I managed to go to the temple on Thursday. When I got there, there were 4 or 5 wedding parties taking pictures and being generally happy! When I came out of the temple, the wind had picked up and clouds had rolled in. I hope all those brides got all the pictures they needed before the weather turned. I’m going to encourage the older kids to also go to the temple often during the summer. I think it will be a good bonding experience for the three of them, and also keep in focus what really matters. They did go Friday morning, and it was fun to see the three of them getting into the beat up old truck and head off to the temple. They said it was “crowded”, and they had to wait a long time. I guess that’s a good thing, right? Maybe they will be nicer to each other after having that service experience. Let’s hope. I can’t believe how big my chickens are getting! We’ve only had them a week and a half, but we love them. We survived the drama of the dog attack, nursed that little chick back to health, and the kids named her Pirate (because she had one eye that wouldn’t open after her brush with death (or dog). 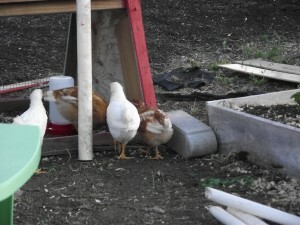 The others are: Henrietta, Gabby and Caramel. Good names for chickens, I think. They aren’t quite the scraps eaters I had hoped for yet. I gave them celery and strawberries yesterday and those same foods are still out there. But I think as they get bigger they will eat more and different foods, not just their chicken food. So, that’s what we’ve been up to this week. How’s your summer shaping up? So it ends. And let the summer begin. Last day of school! How did the school year come to an end so quickly? It’s not even warm yet! Oh, well, despite our many complaints about the cold and rainy spring we’ve had here in Utah, school is indeed over. How did we get here? One party at a time, my friends. One party at a time. We started out with our back to school breakfast at the bus stop. and before we knew it, John’s birthday was upon us. We had a double birthday party day with John and then Natalie and a big blow up velcro wall. Megan and I took a little road trip to the Shakespearean festival in October, and came back just in time to celebrate Natalie’s birthday and then Ryan’s birthday. then welcomed Kazuki into our family for a week at Halloween. There were school parties, church parties, and work parties, which was a good thing because the actual trick-or-treating was VERY cold and wet. & turkeys of oreos and candycorns. Plays about gingerbread were produced. Before we knew it, Christmas was here! January brought a new year and new adventures. A quick family trip to Disneyland was a highlight! We went to lots and lots of basketball games. Then the roadshow took over our lives. and a big fancy anniversary party for Ryan’s parents. Ryan and Paige had trip to New York, and that was pretty much a great big par-tay! Megan had a birthday, and everyone continues to get older. Before we knew it, Easter was upon us. Then it was all a downhill slide toward the end of the year. We had Lagoon days, end of the year class parties, teacher gifts, advancement assemblies, more concerts and recitals, and even some finals. Yearbooks have been signed and phone numbers exchanged. Today is it. The LAST day of school. The kids have had some wonderful teachers, and for that I am grateful. John went from a reluctant reader to a “I love to read” kid who does not shy away from chapter books, even. His teacher was organized, firm, loving, and fun. It was great to volunteer in her classroom and also help out with parties. Natalie and Jenna both had men teachers (one of whom is retiring–sad) who, with their relaxed attitudes and love of fun, gave both girls a wonderful experience for the school year. Cole survived two AP classes and did very well in them. He also survived his second year of spanish, and while he certainly doesn’t speak it fluently, he will have at least a base knowledge of the language, should the need arise to learn and speak it later. Megan was the top of the food chain in junior high this year. It’s good to have those “oldest” moments, and I think she really enjoyed her 9th grade year. She loved being on the basketball team and I am proud of her doing so well in her classes as well. I am very proud of them all and looking forward to spending some lazy days ahead.